AutoGain Pro MK2 is a flexible volume processor with mid/side processing option. The plugin uses the same processing code of the AutoGain Pro but doubles the processing units providing two different detectors and two different processors. The AutoGain Pro MK2 can emulate the behavior of the original AutoGain when set in “classic” mode, but it can also work in stereo or mid/side mode. Each of the detectors can use one of the five different source between internal or external types, each of the processors can use detector one or detector two as it source. This kind of configuration gives AutoGain Pro MK2 a very high amount of flexibility that will let you get not just basic volume automation, but features that belongs to the compressors or transient shaper realm. 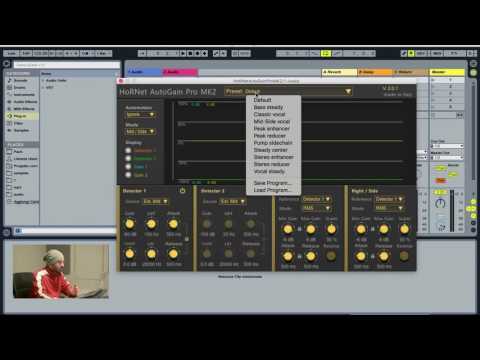 The detectors in AutoGain Pro MK2 allows you to fine tune the control signal for the processors thanks to the attack and release controls and the high pass and low pass filters that will let you restrict the bandwidth of the signal so that only the relevant part to your task is analyzed, you can also set the level of the detector signal to increase or decrease the effect on the processor. The control signal created by each of the detectors is then passed to one of the processors that compares it to the level of the input signal for the processor, gain is computed and applied. The amount of computed gain can be controlled with the “scaler” knob and limited with the “max gain” and “min gain” controls. A large display shows the graph for the gain applied and the levels of the detector, these lines are relative to the minimum and maximum gain set for each processor and can be activated or deactivated as needed. AutoGain Pro MK2 is one of the most versatile gain processors in the market and can give you a very deep amount of control. Once you are happy with the computed gain you can trigger the automation writing mode and save the graphs movements to the host automation, set the plugin on read mode and use the stored automation from the host instead of the internal computing. Of course once the automation is written down you can edit and adjust it to taste. Hi Saverio, this one is quite an improvement on an already great plugin, and the detectors are quite impressive. I'm going to have fun with this one, and I can already see this will be indispensible, as I conjure up how to use it and replace some other plugins currently in my tracks . I totally love your plugins and once again, I feel guilty for what little I pay for these great tools you create. You have my heartfelt gratitude for what you do for us. I'll just go ahead and say this: AutoGain Pro MK2 works better than Waves BassRider plug-in on my electric bass track. AutoGain is cheaper and does a better job. Period. I expect AutoGain to work well on other tracks as well. I have promised you on youtube that Im buying this! So I have purchased this today and Im happy I was given an advice on your plugins! Even though Im using UAD-2, I honestly think you are doing a great job and such plugins as this one are a very handy tool once you learn it well. Its almost like the Waves' Vocal Rider but not quite the same. However I wish you add features or advanced processing code – like you know, sometimes people that give beats for the album are misusing the compressors and abusing the limiters and actually pack much more powerful sound into a flatter waveform, giving a headache during the full-album-mixing stage. Its a problem Im dealing with right now. I love the AutoGain Pro and the VU Meter is also great, but AutoGain Pro MK2 is bad for me. First of all it doesn't work properly in the mid/side mode (it just kills all of the sides, I wrote the support about that but the problem isn't solved)). But even in Stereo mode it somehow distorts the vocals, AutoGain Pro MK1 works better for me.